I am SO impressed...both with the bike and the fact that you two went ahead. I see all of this as only good. Oh, and I really like the bike. 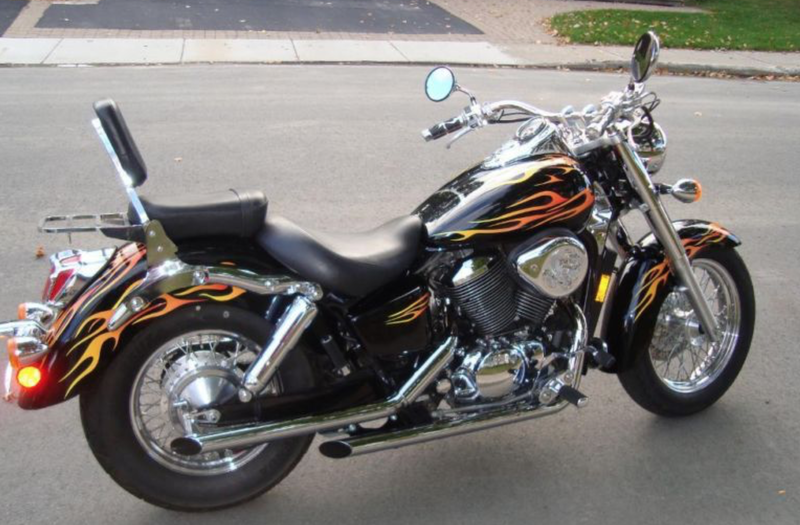 That VStar Lady blogger has had me watching closely for bikes just like hers and yours is close enough to be considered. Can't wait for the travels El Toro will be making with you two at the controls. I can't wait to see what changes Sonja makes after seeing the updates to the Sportster. GREAT! Safe enjoyable riding for you both. Maybe you'll head "south of the boarder" for a test ride. http://redlegsrides.blogspot.com/2006/08/my-bike.html and her name was Gretl. Good timing, David. I just had my second posting up. Sometimes I still scratch my head wondering how we pulled this off this fast. Can't wait to see you riding her home. I used to work for a firm that started coownership of business jets - can I interest you in a wing flap from a Learjet35A? PS I meant to say what a great idea and enjoy the flaming ride! There is farkling to do before Black Betty hits the road. Most is trivial stuff, but still. RAM mounts (got'em), air horn (in transit), dual 12V outlets (gotta wait to get my hands on the bike), saddlebags (ditto), assessing whether the Cobra pipes stay or the OEM pipes go back on (a joint decision, subject to noise abatement by-laws), and then the stuff we haven't figured out yet. Richard, who knows, you may be right. Those flames may be a better fit than I think. I've got a Viking jacket review in the works. When I got the jacket, writing the review seemed like such an incongruous stretch. Now it will be like hand-in-glove. Dave I couldn't wrap my mind around it either. The way my broker explained it to me is this. I'm already insuring the Vespa. I'm the only licensed rider in the home. I can only ride one bike at a time. Sonja will be insured as a second driver. Given that she's in Germany, that's a no-brainer. No matter how long she stays over here riding the bike, she will still be considered a second driver. In the end, the premium for adding the Honda represents the incremental risk. The year I sold the first Vespa, I insured both bikes, and the incremental premium was $0. Now the registration for the new bike is about $600 which includes the no-fault coverage. I'm paying at $400 for the Vespa, so all told that's about $325-ish for insurance, and $1,000 for registration for a total of $1,325 for two bikes. Congrats to you two for making the dream happen. I can't think of a better way for you two to each get to ride a new to you motorcycle. But those flames..... they are something. I agree with Nikos - enjoy the flaming ride!! Thanks Jim. If we do that Piaggio gig, I'll be on the Vespa, assuming Sergei ends up riding from Calgary. If Sergei needs the Vespa, then you'll get to see Black Betty. Very cool Dom. One more thing in common. Hmmm... when the stars align, the stars align. Also, bear in mind, that the internet changes everything, it really does. Let's see Nick... I could afford co-ownership of a control knob off the Learjet dashboard. My son Jonathan was looking into setting up a commercial co-ownership proposal for exotic cars. But going from personal to commercial was just too complicated. Insurance and financing became hurdles too difficult to overcome. As long as the equation remains personal, it's astonishing how easy it is. Nick, once the bike is in hand, it's going to start driving Sonja crazy. Flames indeed. I know Dar... I dug into your blog, basically the same bike. Sonja may start encouraging me to ride out your way and drop the bike off in your care. Thanks Brandy. This is definitely going to spawn a rich trove of stories. Not to mention documenting this adventure so that others may benefit. David, any chance you might be clairvoyant? They are well done decals with clear coat over the top. Sonja suggests waiting a year to see whether we want to repaint. The consensus seems to be $1,000 to repaint, maybe $300 if you pull the parts and prep them yourself. Chain drive. Shaft drive started one year later in 2004. Thanks for stopping by Alan, and thanks for the tip. Steph's blog has been added. Well done. I'm sure you both will get a lot of pleasure out of the bike. For myself, I like the more upright seating of a standard bike, not a cruiser with feet forward. Just my preference of course. Ed I think you're right. For me the cruiser is a bit of a lark. A chance to get my feet wet with a big motorcycle. The Vespa will remain my daily commuter I suspect. If I were to tour on a a motorcycle, I think it would rather be on a BMW GS or something similar, quite possibly a BMW R series like yours. Sonja is going to use the Honda to tour. She is comfortable touring on her Harley Sportster, and hopefully the Honda will be a familiar feel for her. The other factor for both of us is cost. The Honda was extremely affordable. That is what makes this peculiar arrangement work for us. Well done Sonja and David - enjoy your dual ride! Thanks Karen, we'll see how this goes. We'll be posting information about the experience so that others who may be curious about doing it themselves will get the benefit of how we went about it. Starting a blog can be very easy, and it can become as complicated as you'd like when the time comes to make it fancier. If you're starting out, Blogger by Google is a very easy way to get started. I wouldn't say that it takes a lot of time, but it does take lots of patience and time before you get noticed. The key is therefore blogging about a topic that really interests you, and offering information that is helpful to people like you who share your interest. Eventually the mysterious ways of Google will connect you with an audience. You might even find new friendships to treasure for years to come. Thanks for the kind words, and for stopping by to leave a comment. Thank you for the very kind words. As you can imagine, hearing from new readers is always uplifting. keep a reader amused. Between your wit and your videos, I was almost moved to start my own blog (well, almost...HaHa!) Great job. Thank you for the encouraging comment. Offering good content that entertains and informs is the reason I post to this journal. Thanks foe taking the time to comment.